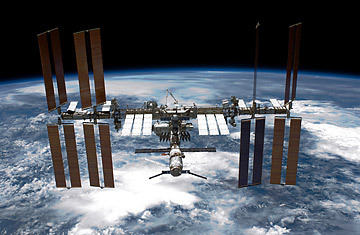 The Space Station: Will NASA Abandon Ship? The International Space Station (ISS) is seen from NASA space shuttle Endeavour after the station and shuttle began their post-undocking relative separation May 29, 2011 in space. Critics of NASA aren't saying "I told you so" yet, but some of them are surely muttering it under their breath. The word from the space agency last week was that the International Space Station (ISS), the American-led, $100 billion skyliner that has been continually occupied by astronauts for more than a decade, may have to be evacuated by early December if the Russian space agency can't sort out what caused an unmanned Soyuz rocket on a resupply mission to crash into Siberia on Aug. 24, scattering nearly 2 tons of cargo across a barren stretch near the Mongolian border. Since post-shuttle NASA relies on Soyuz rockets to carry American astronauts up and down, it may mean everyone out of the pool till the booster malfunction can be analyzed and fixed. Things weren't supposed to happen this way. When the final space shuttle was at last mothballed in July, space planners accepted that it would be a few years at least before the U.S. would have a new way to put astronauts in space. That's not as bad as it seems: NASA was similarly grounded from 1975 to 1981, between the Apollo and shuttle programs. And while we didn't have a space station that needed tending back then, we also weren't on friendly terms with the Russians  who these days are happy to sell us seats aboard their workhorse Soyuz, a booster that first flew in 1966 and has since logged 745 safe launches against just 21 failures. But the Aug. 24 flight added to that failure list, with a third-stage generator malfunctioning in the 325th second of the flight, leading to the crash. Had a crew been aboard, they probably would have been able to abort in time, but that's hardly a sufficient margin of error for future flights, and so the entire Soyuz line has been grounded until future notice. There is no risk that the six astronauts aboard the ISS  three Russians, two Americans and one Japanese  will run out of supplies anytime soon; the station generally overstocks against just this kind of eventuality. But the carefully planned crew rotation has been thrown into turmoil. A fresh crew of three was supposed to have been launched on Sept. 22 to relieve half of the current station occupants. If that flight does not go ahead, the existing crew can stay aboard only so long. A pair of Soyuz spacecraft with three seats each are docked at the station, serving as guaranteed tickets home. But safety rules prohibit the ships from remaining in space for more than 200 days, since their batteries can lose power and corrosive thruster fuel can degrade rubberized seals. The clock expires in September for one of the capsules and early December for the other. Without a new crew, the astronauts will simply have to hit the lights, lock the door and leave the place empty. "We really won't be abandoning the station, though that's how some people have described it," says Kirk Shireman, ISS deputy program manager. "The people on the ground will be watching and maintaining it just as they do now." That constant surveillance eliminates the risk that the unmanned station will deorbit, as the truly abandoned Skylab did in 1979, when it fell through the atmosphere and crashed into the Australian outback. Any instability or orbital decay can be corrected with thrusters and an onboard engine. "What's more, we have gyros that allow us to maintain the orientation of the ISS without using up any of its thruster fuel," says Shireman. Even some of the scientific experiments will continue, though only the ones that don't need to be managed by human hands. More troubling is what the development says about NASA's long-term planning skills. The agency knew for years that the shuttles were living on borrowed time, and in 2004 the Bush Administration launched a return-to-the-moon initiative, charging NASA with building two new launch vehicles (a heavy-lift for trips into deep space and a smaller rocket for Earth orbit), a new crew capsule and a lunar lander. In 2010 NASA and the Obama Administration scrapped that program, putting the deep-space effort on a low simmer till sometime after 2020 and outsourcing the Earth-orbit portion to the private sector. That left a gap that, unlike the Apollo-to-Soyuz interval, was not guaranteed to be filled by a new NASA vehicle anytime soon. "With where we are today," concedes Shireman, "we have one transport provider for humans. When something happens to that provider, you can't transport humans." The private sector is not sitting idle; several companies are already well along in their plans to build new boosters and crew vehicles. Leading the race is Space Exploration Technologies Corp., or SpaceX, founded by Elon Musk, creator of PayPal. Last December, SpaceX became the first private company to orbit a large payload and recover it safely, and this Nov. 30, it is set to go further, launching an unmanned resupply vehicle to the ISS that is designed to deliver cargo and bring home spent equipment. The company is under a $1.6 billion contract with NASA to perform 12 such resupply missions, assuming the early tests go well. But even if they do, the next step  adapting the cargo vessel so that it can carry people  will be a lot more complex than simply bolting in seats and pumping in oxygen. Despite Musk's own boasts ("If there had been people sitting in the ... capsule today, they would have had a very nice ride," he told the press after the December mission), veterans in the field know that the job is a massively challenging one, with design gremlins lurking everywhere and almost no tolerance for mistakes. "It's gonna take a while," Shireman admits. Until Musk or one of his competitors manages to turn out a reliable, homegrown ship, American astronauts will continue to rely on Russian engineers to maintain a Soviet-era rocket that can carry both countries back to orbit. The space race of old is long gone  and what comes next is still impossible to say. See pictures of the Atlantis crew. See amazing pictures of the sun.